Lot 7445, Jalan P4/1, Section 4, Bandar Teknologi Kajang, 43500 Semenyih, Selangor, Malaysia. 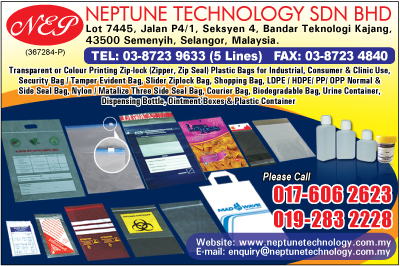 Established in 1996, Neptune Technology Sdn. Bhd. is a leading manufacturer & exporter of food grade re-closable ziplock bags and re-sealable bags that come in a wide range of standard sizes. In addition we also manufacture disposable plastic containers used for the pharmaceutical, chemical, cosmetics and lubricants industries. Special designs can be tailor-made upon customers’ request. Our 10 years of experience in this business enables us to manufacturer high quality bags and containers, coupled with our strong belief in providing good service. This has resulted in trust by our customers from all over the world.